As we start the second of week of December today, that shopping list is really going to start keeping you up at night! Fear not my sleepless Santas! This Thursday, December 8th from 5-9pm, the shops in Montgomery are going to hold their first Holiday Open House! With a wide variety of stores opening their doors to holiday shopping, cutting down the items on your Christmas list will be easy as pie. Not only are shops extending their holiday hours just for you, but they’re also giving complimentary wine, light refreshments, and appetizers! What more could you ask for?! 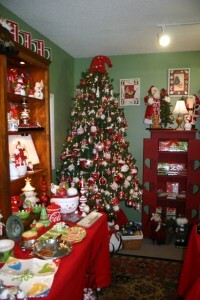 We’ve also got the inside scoop on The Little Red Gift Shop’s plans for the event! They’re going to have Santa (Yes!) and a professional photographer there to do pictures for a small cost! Also at the event will be a Toys for Tots bin, and to encourage you to bring in something for the bin, anyone who brings a toy will get 10% off their purchase for the evening! Holy Cow! Other participating stores include: Blaine’s, Gattles, Little Lords and Ladies, Ute’s Uptown Girl and Downtown Girl, Blue Cocoon, Pink Tulip Club, Travelessence, Frame House Gallery, Haute Chocolate, Krombholz Jewelers, and Blue Moon Furnishings! All of these stores will be having special savings and giving support to charities! We’ll see you on December 8th in Montgomery! My favorite place for one-of-a-kind gifts, The Little Red Gift Shop, is having a “Christmas in July” sale this weekend – Friday July 22 through Sunday July 24. My friend Kelly who owns it said (believe it or not) that the end of July is the kick off of the holiday season! She says she’s been busy “holidayifying” the shop the past couple of weeks! 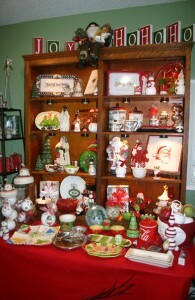 Kelly and her mom Betty Donnellan run both The Little Red Gift Shop and the year-round Christmas Shop. The two shops are housed in the same 1,100-square foot building in Old Montgomery (7925 Remington Road in downtown Montgomery, a block and a half east of Montgomery Road). Click here to read another blogger’s post about the recent renovation of the two stores. This weekend, both of the stores will be featuring a 20% sale off all merchandise to get everyone in the holiday shopping spirit! I’m not much of a “holidayifier” – we usually put up our tree and lights a week before, and never get around to taking stuff down until March. But I know a lot of people love love love the holidays and get excited when they see Santas and reindeer hit the shelves. If that’s you, make sure you check out this sale! And even if it’s not you, I suggest you still check out The Little Red Gift Shop. They have really cute gift items for girlfriends (like painted wine and martini glasses), funny cards, unique gifts for dads and hubbys (tons of “mancave” gifts! ), cute stuff for mom, and even co-workers. It’s also a great place for gifts for you! I just picked up a great necklace for my mother-in-law and a bracelet for myself there! The hours for the sale are Friday 10 am to 6 pm, Saturday 10 am to 5 pm, and Sunday 12 pm to 5 pm. Click here to learn more about the event/sale.